The learners from Shillong in CIPET Guwahati, along with other students. The daughters and sons of waste-pickers from Shillong, a provincial capital city in the North Eastern State of India, Meghalaya, got placement after rigorous training in plastics manufacturing. This training is specially instituted for waste-pickers and their children to move up in the ladder of recycling and manufacturing. It is instituted by the union government and is provided free of cost. After the training, the placement of all those who have undergone training is ensured. With the support of the National Safaikarmacharis Finance & Development Corporation (NSKFDC) and Union Ministry of Skill Development and Entrepreneurship, Central Institute of Plastics Engineering & Technology (CIPET) has initiated three- and six-months programme of skill development in plastic processing. The Alliance of Indian Waste-pickers reached out to the NSKFDC to provide that training to waste-pickers and their sons and daughters and include them as a priority group. The training is given free of cost, hostel facilities are provided by CIPET and later support is given for placement. The placements are in plastic manufacturing and recycling units with market competitive salaries. The minimum requirement to be eligible for the training is being 8th Pass to 12th Pass and above the age of 18. 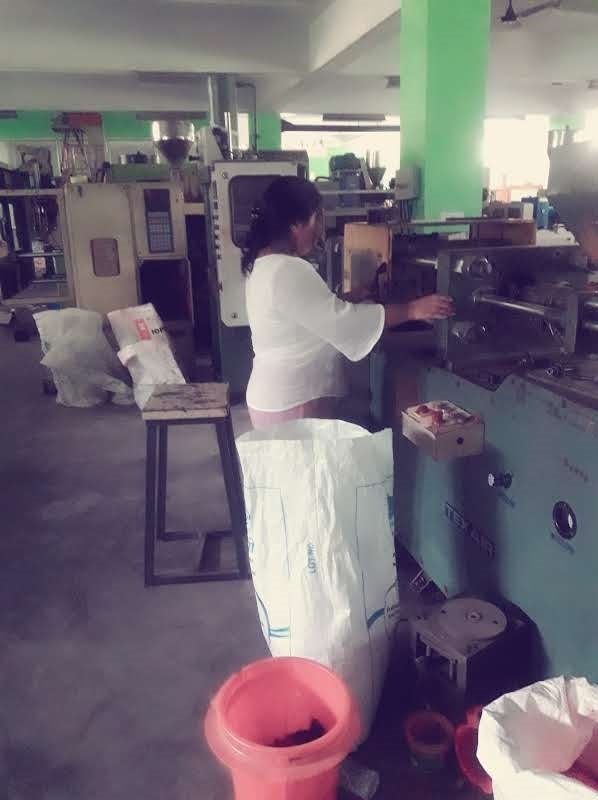 Ibapynhunshisha Kharnaior operating a plastics manufacturing machine. Last year, the Alliance members based in different cities, Bangalore, Vijayawada, Guntur, Delhi, Shillong, Mumbai, Pune visited the CIPET facilities in their respective states to learn about the training programme. The waste-pickers group based in Shillong: Iainehskhem Self Help Group and Bangalore: Hasiru Dala, followed up the conversation with CIPET and pursued enrollment of their members’ children in the three months course. A biodata with information about education status, languages known, a copy of the address proof and copies of school certificates is all it requires to get enrolled. After the visit, four daughters: Cynthia Marboh, Ibapynhunshisha Kharnaior, Lasanshisha Syjemlieh, Lavina Lyngdoh Peinlang and two sons: Jamshaphrang Syjemlieh, Saiborlang Noongsiej of waste-pickers in Shillong enrolled in the given course at CIPET, Guwahati. The course provided machine operating skills for manufacturing thermoplastic and thermoset plastic. The machines include Injection Moulding Machine, Blow Moulding Machine, Extrusion Moulding Machine, Hand Injection Moulding Machine, Extrusion Blow Moulding Machine. All six have finished the training and have been placed in a company Hyderabad with market competitive salaries and other benefits.